BC&A recently completed the permitting, design, and construction management of a project for the Sandy City Administration Office. 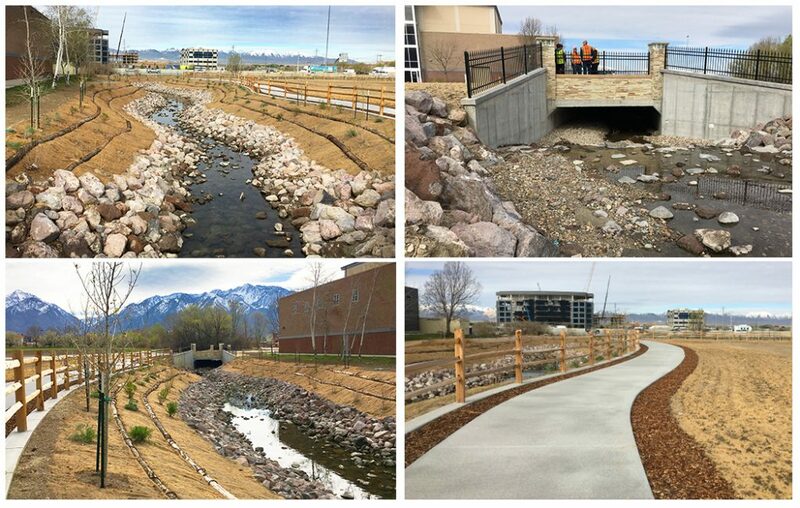 The project consisted of five years of environmental permitting, the design of a box culvert, channel design (designed to convey the 100 year storm), and landscape restoration. The project also included coordination with Sandy City public works, public utilities, parks and recreation, and the mayor’s office along with several agencies. This channel realignment is located at the Sandy City SouthTowne Mall, behind REI and adjacent to I-15, and was part of the Monroe Street drive extension into the mall and key to the future development of the mall/city hall area (future Cairns development – downtown Sandy City). We are currently in the planning stages for the next phase of this project. Thank you to a great team that helped get this project done. This project will be monitored by us for the next eight years (per the US Corps of Engineers regulations) as the vegetation begins to fill in and the site gradually restores itself.